NOTE: On NNR Samantha Bunten of NBC Sports and I analyzed the draft for the Browns. Tomorrow Peter Brown and I will discuss the draft in general and the Browns picks in particular. This is what I said about it as soon as the news hit. Deflationgate is a disaster for the NFL, the Pats, HC Bill Belichick and QB Tom Brady. I do not believe that anyone in the Pats organization even blinks without approval of Belichick. He runs that team with an iron fist. To think that he did not know about balls being under inflated is a joke. If the AFC Championship game was the first time that it had happened, it could be seen as an anomaly. But we have learned that the same thing happened when the Pats went to Indy to play the Colts. The latest report from NBC Sports is that the game balls used by the Pats in the Indy dome were also deflated. For those of you that have not been around football, let me make one thing clear—There is no way that an NFL QB can pick up a ball that is 2 pounds per square inch under inflated by 16 percent without knowing that something is different. At 10.5 psi the hand can dig into the ball significantly. It is MUCH easier to grip and throw particularly in bad weather. Brady claims he didn’t realize there was anything different. That is just not possible. Now the NFL has the Wells report. It makes clear that team personnel violated with intent league rules not only in the Colts game but also in a previous Colts game which was played inside. The questions now are what will the league do and which Pats personnel will be fired or suspended. Now the league is considering reducing the inflation pressure of game balls. My bet is that neither Belichick nor Brady will be suspended. If Commissioner Goodell fails to suspend both he should be relieved of his 44 million dollar job. The Pats have violated major rules in the past and have had their fingers pinched by the league. Now it is time to come down hard on the team and those that were involved. If texting during a game was worth a 4 game suspension by the league, how many games should the B boys get for this? Comments: Comments Off on Great win but Browns have a lot of work to do. Great win but Browns have a lot of work to do. Clearly the Browns played a great game to get the win against the Saints. This was the first home opening win in a long time. The final drive by Brian Hoyer reminded me of the Cardiac Kids era. Hoyer drove the Browns from the 4 to a winning field goal. In the recent past the gaggle of quarterbacks the Browns have started would have thrown a pick or taken a bad sack to end the game. Hoyer was outstanding. He was 24 of 40 for 204 yards and 1 TD with no picks. There were more than a few drops as well. But Hoyer hung in and showed he has outstanding vision to see the field. But a QB can not do that without some good catches on the other end. The much maligned WR group did well overall. There were some critical drops but the band of no-names came through when it counted. Miles Austin made 3 critical catches in the final drive. TE Gary Barnage was solid both blocking and catching. He had a key catch on the final drive on a 4th down that kept the Browns hopes alive. The running game was OK but needs work. The backs are both rookies with a lot of talent but need to get more experience. Both backs need a little more help from the O line. The O line gave up only 1 sack but Hoyer was under a lot more pressure than he should have been. The right side of the line is below average. Most of the pressure on Hoyer came from his right side. The O line did not generate the holes to get the running game going that are required for future wins. The D still struggles to get off the field on 3rd down. While it scored a TD, it needs to prevent teams from converting more than 50% of the third down attempts. The D allowed a late 1st half drive for a score. When a team scores like that they usually win the game. Late in the half or the game, the D has to play better. The front 7 played very well early but wore down as the game progressed. They got 2 sacks on a QB that is hard to get because of his quick release. But in the 2nd half the pressure was not there. The team had a couple of guys out but that will happen. In addition the front 7 gave up 6.4 yards per rushing attempt. That is not acceptable particularly against a team that struggles to run the ball. The biggest issue is the edge run. The Browns have struggled to stop that since they returned in 1999. ILB Karlos Dansby played particularly well. The D backfield played pretty well. The one guy that kept the Saints in the game was TE Jimmy Graham. One guy can not cover Graham. The defense needed to have a LB and CB or safety on him at all times. The team should have known that Graham is the red zone target and covered him better. The TD return by FS Tashaun Gipson was outstanding. It almost made up for allowing the score by the Saints at the end of the first half. QB Drew Brees completed 27 of 40. But the defense had just enough stops to keep the game close. Then there is the special teams. The bad snap on the extra point nearly cost the team the win. That is not acceptable but is not new. We have seen that way too often. The kickoff and punt coverage teams were much better this week. The return teams did nothing. It is time that someone beside Travis Benjamin return kicks. He still seems to be favoring the leg he hurt last year. The Bottom line: This was exactly the kind of game that the Browns would lose in the past. The difference this time was Hoyer. Rather than folding in the last drive, he took the team on his back and led them to a win. The play calling was better. The O line held up in the last drive pretty well. All and all, it is nice to have a win to talk about. The fan base deserves it. NOTE: The News, Notes and Rumors podcasts are on hold due to a problem with the site. I apologize for that and hope we will be back soon. Comments: Comments Off on AFL Star Abner Haynes is a great roll model. 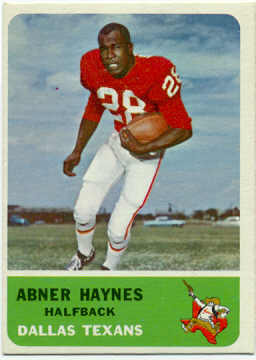 AFL Star Abner Haynes is a great roll model. I have had the great pleasure and honor of having Abner Haynes on News, Notes & Rumors many times over the 5 years that the show has been on. Abner brings a combination of honesty and great sense of history to NNR. But there are a number of things that most fans that did not have the pleasure of watching him play don’t know. Being older than rock myself, I fondly remember watching Abner play. He signed with the Dallas Texans of the AFL in 1960 having been drafted by the AFL, NFL and CFL. As a black man from a small school, he faced racism and the doubt he could play at the professional level. But from day 1 he proved he was up to the challenge. In 1960 he gained over 800 yards rushing and caught 55 passes for 576 yards. Most important he scored 12 touchdowns as a rookie. He was not only the rookie of the year but also won the player of the year in the AFL after the 1960 season. But he proved his metal when the AFL scheduled their All Star game in New Orleans. Abner led the revolt of the minority players that prevented the league from going to a city that flaunted racism with misplaced pride. He and his fellow players forced the league to move the game to a more racially friendly location. Abner is not only a former football star, he is a pillar in the community. He heads up the Heroes of Football organization (@footballsheroes on Twitter) that is dedicated to bringing justice to the former players and focus to the youth interested in the game. He has spent much of his time working with kids to give them a love of learning as well as football that will help them for their entire lives. I consider myself very fortunate to have Abner as a friend. He is currently fighting a very serious disease with courage and a sense of humor that have been hallmarks of his life. He deserves our prayers for a complete recovery. I am proud to call Abner Haynes my friend. The world and the US are a much better places having had men like Abner among their citizens. NOTE: Check out the live News, Notes and Rumors show on Monday, Thursday and Friday at 6 PM Eastern on or on https://fryingpansports.com/radio-show/. On Monday Samantha Bunten of NBC Sports and I discuss the results of the weekend. Thursday shows alternate between NFL Draft and basketball. On Friday Tony Williams Giants beat writer for Metro New York joins Samantha and me to preview the upcoming games. Tonight David Kay basketball writer for walterfootball.com joins me at 6:30 Eastern to talk about the Cavs, the NBA, Ohio State and college basketball. Join us at 6PM. I want to thank all of you for your support of the show. Thanks from the bottom of my heart. Broncos HC John Fox is back with the team. It was great to see him back and the staff at FPS wishes him the best of health. RB Trent Richardson was benched by Colts but they say they still believe in him. KFFL.com reports that Richardson was “awesome” and “a pro” about being demoted from the starting lineup. All that means is the GM and staff is covering its hind end about giving up a #1 pick for him. Cleveland Browns QB Brandon Weeden (concussion) completed 24 of his 40 passes with 3 TDs and 3 turnovers but no one was quite sure which hit caused the condition. It was not a coincidence that NFL rules prohibit a concussed player from doing a press conference. New York Jets head coach Rex Ryan benched QB Geno Smith after the first half of bad play but said he will start next week. Vikings QB Christian Ponder (head) did not return to the game last week and is questionable for the next contest. Seahawks WR Percy Harvin (hip) will be a game-time decision for the game against at the 49ers next week. Based on their crushing win over the Saints, that is not good news for the league. Broncos DE Derek Wolfe (illness) suffered seizure-like symptoms Friday, Nov. 29. He is out of the hospital but there is no word about when he might return to the field. Steelers HC Mike Tomlin was fined $100,000 by the NFL for Sideline-gate when he stepped onto the field during a kick return. Lions 40 Packers 10 – The Pack got Flynned. QB Matt Flynn showed everyone why he has been cut twice this season. He was sacked 7 times, lost 2 fumbles and threw a pick. There was no way the Packers could overcome his play and win. The Packers should get QB Aaron Rodgers back next week but at 5-6-1 it may be too late to get them into the playoffs. The Lions played just OK but thanks to the errors of Flynn, they were able to win comfortably. Falcons 34 Bills of Canada 31 OT – The game was back and forth until the Falcons got a series of pass interference calls to score their final TD with 1:28 left in the 4th. The Bills got the ball into field goal position for the win with less than 30 seconds left but WR Stevie Johnson lost a fumble. Falcon QB Matt Ryan threw for 311 yards and got the critical calls on the last TD drive. The win hurts the Falcons’ draft position. Bengals 17 Chargers 10 – This was a good win on the road for the Bengals. They have lost these games on the west coast in the past. The Chargers were coming off a big win over the Chiefs in KC. The Bengals used the running game to get the critical yards. They have a very good defense, lots of offensive weapons and a good O line. But the weakness of the Bengals is QB Andy Dalton. He will be the reason they will not go far in the playoffs if they make it. Broncos 35 Chiefs 28 – Both team’s flaws were exposed in this game. The Chiefs ran for an average of 6.4 yards per carry. Their special teams returned a kickoff for a TD. The Chiefs defense held RB Knowshon Moreno to 1.2 yards per carry on 15 attempts. All of those areas are concerns for the Broncos. The Chiefs had a 21-7 lead and their vaunted defense let the lead evaporate. Despite playing an immobile QB with an ankle issue, D failed to get a sack. And worst of all after beating up on backup QBs for a 9-0 record, they have lost 3 games in a row two of which were at home. The Chiefs D is very over rated. The Broncos will have trouble winning in the cold because QB Payton Manning has never done well outside in the playoffs. The Chiefs might have won if their WRs could have caught the ball better. Both teams will make the playoffs but even with home field advantage throughout the AFC playoffs, I doubt the Broncos make the Super Bowl. 49ers 23 Rams 13 – The 49er O is getting back to 2013 productivity but the O line is horrible. Don’t believe what you hear from “experts” that talk about how good it is. QB Colin Kaepernick has been running for his life and RB Frank Gore had gotten hit at or behind the line often. The Ram D line is as good as it gets but Kaepernick beat the blitz often thanks to one more quality receiver on the field. WR Michael Crabtree was back. While he only caught 2 passes, his presents on the field forced the Rams to pick which WR got doubled. Kaepernick found the single covered WR often. He threw for 275 yards and a TD. Seahawks 34 Saints 7 – While the Hawks win was more than impressive there is a major warning flag. QB Russell Wilson was outstanding throwing the ball but he was also the top rusher in the game. RB Marshawn Lynch and the rest of the backs averaged 2.6 yards per attempt on 30 rushing plays. The Hawks are going to have to run better if they want to get into the Super Bowl. Jaguars 32 Browns 28 – This was one of the worst performances by the Browns I have seen. And I have been watching the team since 1956. To see why the Browns blew a winnable game, check out my Live Game Notes right here on https://fryingpansports.com. NFL.com reported that the suspension to OG Richie Incognito will be paid in exchange for him agreeing to postpone the hearing until after the NFL reports on the investigation into the harassment charges. This indicates that he will be back on the field long before OT Jonathan Martin will. Look for several teams to be interested in Incognito. The NFL came down hard on Steelers coach Mike Tomlin for being on the field during a kick return by the Ravens. But the NFL should come down harder on the officials that cost the Redskins a critical first down on a nationally televised game due to bad official mechanics. The officials have had a HORRIBLE year and the NFL needs to fix the issue or at least suspend those responsible for major screw-ups. If the Packers can’t get QB Aaron Rodgers back next week, they may put him on IR for the season. Another loss will put the team out of the playoff picture. Rodgers will have another MRI this week to see how well his healing is progressing. With two CBs suspended in the NFL drug program, the Seahawks may sign veteran free agent CB Antoine Winfield. Colts OC Pep Hamilton is feeling the heat after the offense has struggled badly over the last few games. But no OC can fix an offensive line that leaks like the Titanic. Without protection, no QB can be successful. By far the biggest news of the weekend was the Monday night injury to QB Aaron Rodgers. The latest report indicates that he has a break in his collar bone. Without Rodgers the Pack has little chance to make the playoffs. Our thoughts go out to two NFL head coaches with health issues. FPS staff wishes both John Fox and Gary Kubiak a fast complete recovery. The job of an NFL coach is a 20 hour a day 52 week a year sentence. Those that take the job understand the physical demands that come with it. However, they do it for the love of the game. Season ending injuries are way up this season. If the trend continues this season will set an all time record for such injuries. Many of the injuries are to the legs and knees. This is an unexpected result of the focus on concussions. Defenders are hitting lower causing the knee injuries. If the league tries to legislate low hits it will make tackling almost impossible. Jets 26 Saints 20 – The Jet D line kept pressure on Saint QB Drew Brees all day. The two interceptions by Brees were both tipped balls caught by the Jets’ DBs. The D held the Saints to 3 of 11 3rd down conversions. Former Saint RB Chris Ivory burned the team that traded him by running for 139 yards on 18 carries for a 7.7 average with a TD. Jet QB Geno Smith was just 8 for 19 for 115 yards with no TDs and no picks. Eagles 49 Raiders 20 – Eagles QB Nick Foles tied an NFL record throwing for 7 TDs. He burned the Raiders D for 406 yards with a 14.5 average per attempt and no interceptions. Raider QB Terrelle Pryor had a bad game going 22 for 41 for 288 yards but no TDs and 2 picks. The Eagles D sacked Pryor three times but ran for 94 yards on 10 attempts. He hurt his knee but may be able to play next week. Foles performance may put an end to the Eagles career of Mike Vick. Titans 28 Rams 21 – This was a battle of runners. RB Chris Johnson finally began to earn his big check Sunday. In his biggest game this season he got 39 yards. Against the quality Ram D Johnson ran for 150 yards on 23 carries. Rams RB Zac Stacy ran for 127 on 27 carries. Both scored twice. The game was even deep into the 4th quarter. Kelllen Clemens was sacked and fumbled with 2:54 left. The Titans recovered on the Ram 19 and scored the final TD. The Rams got the ball back twice but could not recover. Redskins 30 Chargers 24 OT – The Chargers defense scored first on a pass from the endzone being blocked and intercepted for a TD. The Redskins had balance on offense and got one more interception than the Chargers got. Redskin QB Robert Griffin threw for 291 yards and the team got 209 more on the ground. The Chargers depend on QB Phillip Rivers’ arm because they left the running game at home. RB Robert Mathews had two 100+ games coming into the game but got only 7 carries for 34 yards. Rivers threw a 19 yard pass for a TD and the Chargers kicked a field goal to tie the game with just 3 seconds left in regulation to tie the game at 24. But the Skins got the ball first in OT and Griffin drove the team down the field for the TD that ended the game. Seahawks 27 Bucs 24 OT – Tampa forced 3 turnovers including two interceptions and they built a 21-0 lead. Buc QB Mike Glennon was outstanding throwing for 2 TDs without a pick. But Hawks’ QB Russell Wilson and RB Marshawn Lynch brought the team back. Tampa’s defense harassed Wilson all day. He had no time to read the D and throw. A TD pass from Wilson to Doug Baldwin tied the game with just 1:51 left in the 4th. Then Wilson and Lynch drove the team to a winning field goal on their first possession in OT. Colts 27 Texans 24 – The Texans had a 21-3 lead at half time. Then Coach Gary Kubiak collapsed leaving the field and the team seemed to lose focus. The team supports the coach despite the struggles of this season. The Texans played their best game of the year but the loss of their coach took the air out of the team and the crowd. Panthers 34 Falcons 10 – The Falcons’ season is officially done. QB Matt Ryan threw 3 picks and lost a fumble. Panther QB Cam Newton did not play all that well but the D was solid enough to win. With the loss by the Saints, the Panthers are only a game behind and in good shape to make the playoffs. Browns 24 Ravens 18 – The Browns beat the Ratbirds for the first time in 12 games. It was a big game for both teams and the Browns found a way to win. For more on this game check out Browns Ravens Live Game Notes on https://fryingpansports.com/ and the radio version of NNR with Samantha Bunten of NBC Sports covering the game on https://fryingpansports.com/radio-show/. The Redskins are protecting QB Griffin by not allowing him to run as much. He did run 6 times but most were because the pass protection broke down. He averaged only 2.8 yards per carry. He is fearless running the ball. The Skins are using option plays to replace his rushing yards with the TE or WR carrying the ball. But even on those plays Griffin will get hit. The team gave a lot to get RG3 and they need to protect their investment. The Seahawks are going to get QB Russell Wilson killed because the O line is in shambles. I pointed this out in week 1. He is running for his life on almost every snap. If he gets hurt the season is ruined. It is the major failure of Seahawk management to fail to insure adequate pass protection. The Bucs have to be heart sick having played as well as they did for four quarters in Seattle only to lose in OT. The team is playing hard but it has way too much talent to be 0-8. Don’t assume the Texans will be in the first round QB derby in the 2014 draft. The organization believes that undrafted QB Case Keenum has shown enough to be a candidate for the job next season. He has thrown 4 TDs without a pick. He did fumble twice. The O moved much more efficiently under Keenum than under Matt Schaub. Keenum also helps attendance since he played at Houston. This means that Schaub will be elsewhere next year. The team may still draft a QB but it will likely be in the 2nd or 3rd round rather than round 1.